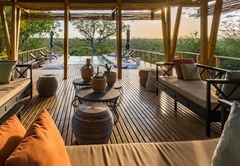 Simbavati Hilltop Lodge is a Limpopo game lodge providing a wildlife experience for tourists visiting Valley of the Olifants. 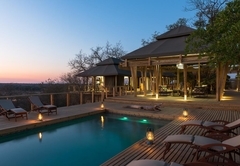 Situated within the Timbavati Game Reserve, Simbavati Hilltop Lodge offers game lodge accommodation in private luxury safari tents that boast splendid views. 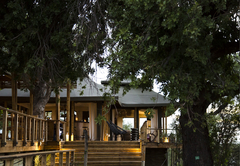 This is a fabulous spot for a romantic getaway where you can enjoy viewing game from the deck. 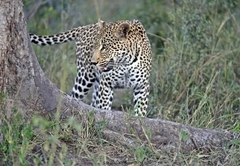 There are early morning and late afternoon / evening game drives. 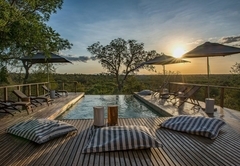 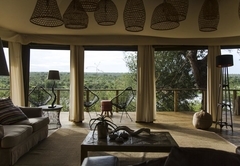 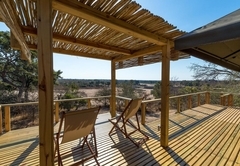 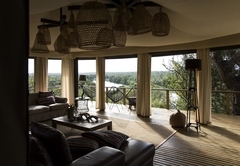 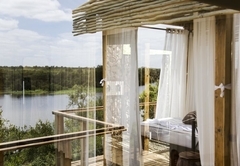 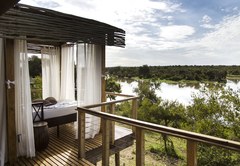 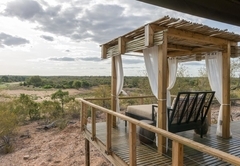 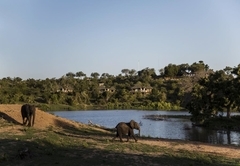 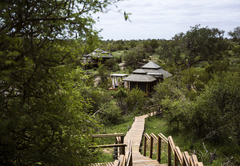 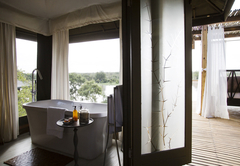 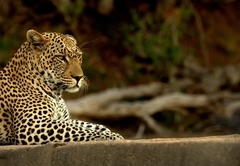 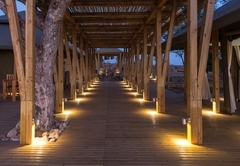 Enjoy magnificent views of the wildlife from the unique contemporary lodge facilities or daybed and experience a game safari exploring the abundance of wildlife, including the Big 5 as well as the unspoilt landscapes of the reserve. 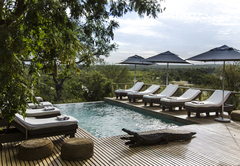 Simbavati Hilltop Lodge has eight luxury safari tents, each one sleeping two adults. 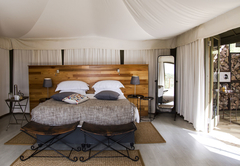 The tents are connected to the main tent via a small passage with an opening to the outdoors. 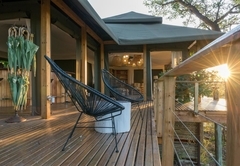 Each tent has a a private deck to take in the scenery and is equipped with two point plug converters, air-conditioning, ceiling fan, tea / coffee making facilities, complimentary toiletries, eco-friendly insect spray, hair-dryer, mini bars with drinks and snacks, electric blankets on beds for the winter and a laundry bag in room. 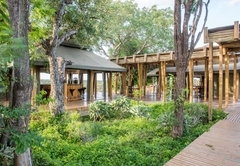 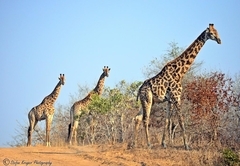 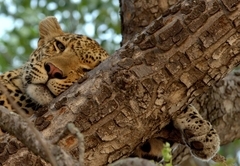 Kindly take note there is a compulsory Timbavati Private Game Reserve conservation fee of R 328.00 per person per day which can be prepaid with the lodge and the Timbavati vehicle entrance fee of R 140.00 per vehicle payable on arrival. 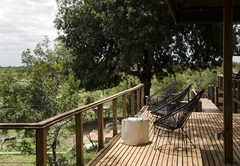 Rates are subject to change without prior notification. 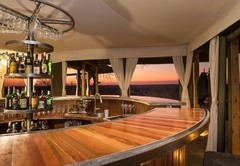 Rates include accommodation, all standard meals, two game drives per day, selected drinks (selected spirits, house wines, local beers and soft drinks). 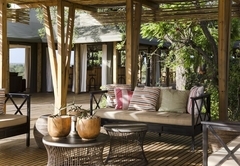 The lodge has an infinity pool, a covered outdoor lounge area, a dining area, a bar and a curio shop. 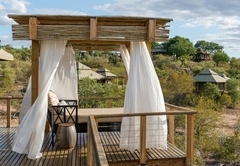 Luxurious and individual pavilion style safari tents offering king-size or twin-bed options, a separate en-suite bathroom allowing for an indoor or private outdoor shower experience as well as a private viewing deck and daybed. 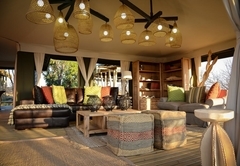 Other drinks (see above*), private transfers, gratuities, laundry service, other items of a personal nature. 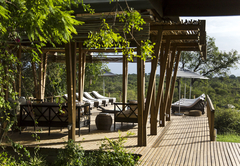 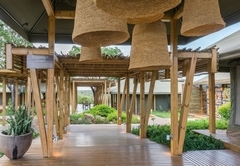 Response timeSimbavati Hilltop Lodge typically responds to requests in 5-10 minutes.